Come face to face with the largest exhibition of real mummies and related artifacts ever assembled. The exhibit provides a window into the lives of ancient people from several regions of the world including Europe, South America and Ancient Egypt, offering unprecedented insights into past cultures and civilizations. Inside every mummy is a story waiting to be told. Through modern science and technology, their secrets are now revealed. Mummies of the World tells the story of the mummies and mummification through state-of-the-art multimedia, hands-on interactive stations and cutting-edge 3-D animation taking visitors on a 4,500-year journey to explore the mummies’ history and origins as well as how they were created, both through natural and intentional practices. Mummies of the World highlights real advances in the scientific methods used to study mummies, including Computed Tomography (CT), ancient DNA analysis and radiocarbon dating, all of which allow researchers to learn about the lives, history, and cultures of the mummies. Who were they? Where did they come from? And what can they teach us? Peek into the lives of ancient people and cultures from many regions of the world to learn about past civilizations. 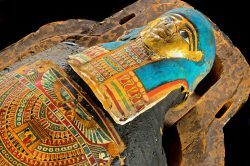 What secrets do mummies hold about the past? What clues do they bring us for the future? A journey awaits as we unravel their mysteries in Mummies of the World.